A whalebone and driftwood frame, with a sea-lion skin stretched tautly over it and waterproofed with whale fat, hardly suggests a budding Olympic sport. Yet the kayaks that meant life to the Inuits in the Arctic for centuries have become the racing kayaks of the modern world - even if the building materials have changed. The link was 19th century British barrister John MacGregor. He studied the ancient kayaks, designed a similar boat and disappeared into the rivers and lakes of Europe's wilderness to become a noted travel writer of his time. When others copied his boat, he founded the Royal Canoe Club, and canoe regattas began a year later in 1866. Canoe/kayak, consisting solely of the sprint, was a demonstration competition at the 1924 Olympic Games before gaining full-medal status in 1936. Europe remains the traditional power base, led by Germany, Sweden and the athletes of the former Soviet Union. Races are held on flat water, with competitors assigned to lanes. Women compete only in kayaks, the closed boats paddled from a sitting position with a double-blade paddle. 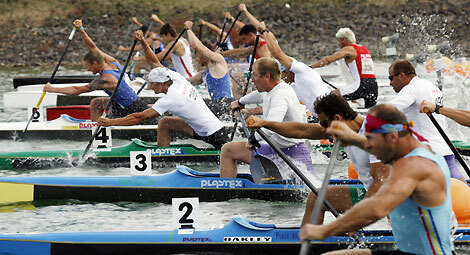 Men race in kayaks and canoes, the open boats paddled from a kneeling position with a single-blade paddle. Women race in the 500-metre K1, K2 and K4 (denoting one, two or four paddlers in a kayak). Men compete in the 500m and 1000m K1 and K2, 1000m K4 and 500m and 1000m C1 and C2 (canoe).